Don’t worry about my kids; they will do just fine without my money. This week I am starting Friday Night Links to highlight personal finance articles I find interesting this week. Although this is new, it is a continuation of featuring personal finance articles from the long running KC Awards. The selection of blogs is up to the committee of one established by krantcents as a representative of the Academy of Frugal Journalistic Writers. That committee can be influenced by meaningful comments, signing up for my RSS feeds, backlinks, links, trackbacks, Facebook Likes, Twitter, Retweets, Digg, StumbleUpon, delicio, Yahoo Buzz, Google Bookmarks and other social media. If you plan on creating a single purpose political action committee (PAC) to buy advertising on my blog to solely influence the committee, please go ahead! Please understand it will not influence the results. My University Money – Will The Real Cost Of Education Continue To Rise? World of Finance – What is the Law of Diminishing Return? Ultimate Smart Money – Warren Buffet Bought IBM Stocks, What’s Your Plan? Friday Night Links is officially premiered. The Old Guy Edition is the first of many more. Happy belated birthday and congrats on turning 65. I like the Friday Night Links concept. Thanks, I think the great thing about a “small business” is you can make (small) changes and improve your traffic. Happy birthday mate. I like that you are keeping your round up exclusive, hopefully I write something that is worthy of making the list sometime. Great selection for this week. Thanks, I hope to include everyone at some time or another..
I’m honoured to be a part of the inaugural Friday Night Links edition. Although I’ve only roamed the Earth a fairly short period of time (it’s all relative anyway) I’ve been told I’m old at heart, so I think I can handle “The Old Guy Edition.” Thanks for the recognition KC! I am the only “old guy” which is okay. I am just trying to showcase some good articles that I ran across. Happy Birthday KC! Thanks for the mention it is quite an honor! You’re welcome, I hope to feature more good articles. First of all, Happy Belated Birthday! I wish nothing but best for you. I am very honored to be mentioned on your blog. You’re welcome, I like the challenge you laid out in your post. Happy Birthday, KC. Btw, I have told my children that my idea of good financial management is to have doesn’t include leaving inheritance. 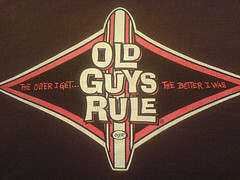 As to the ‘Old Guy Edition’ – a good one. You, me and Warren Buffet all think a like! 🙂 Luckily, my children are doing fine and will be even more successful without my money. It is sort of funny that now that I am finally old, I don’t feel like it. I only select 5 posts a week, there is always next week. I like the new format KC! I am using my own advice, small changes work extremely well! Every week, I will try to find the 5 best articles of the week. Your articlestruck me because of your perspective of wanting more than we need. Over the years I have learned that it’s more important to only have what we need, saves space in the house and easier on the wallet. Todays closets are more than twice the size of closets in older homes. This says a lot! I hate having stuff that doesn’t get used… It’s sad that our society as a whole consumes to no end, thinking that they always need more stuff! You are right! In fact, I prefer fewer things, but higher quality. I find it lasts longer and looks better too. In the long run it is cheaper. Happy late birthday. 🙂 Thanks for the mention. Thanks, savings are my number one priority. Thanks, but nothing changed! I thought I would feel old instead I feel the same. I feel like I am 28! 65? I had no clue! I am much younger than my chronological age. I never could relate to old people. My cousin who is 83 is the same way. He has the energy of a 20 year old. My mother was the same way as well. I’m boggled by your numbers. 65? Happy Birthday, but you act like you’re in your 20s! 500 articles a week? You are a reading machine! Top 5? That’s quite an honor. Will need to step up my game, thanks for the inspiration! Thanks. I thought I would feel different and I don’t! I actually feel better than when I turned 30 years old.